I've been pulling out my Valentines stuff and thought I'd jump in today. I'm on jury duty and have to be back in court after lunch. I made these last year and never sewed them into pillows. I'll do a little how -to this week. Hopefully I'll finish them before Valentines Day this year. 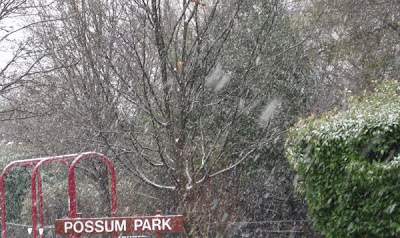 This is what I drove through this morning-not much to you northerners, but for Texas-it's pretty exciting. I'll be back later to show you what I've come up with. 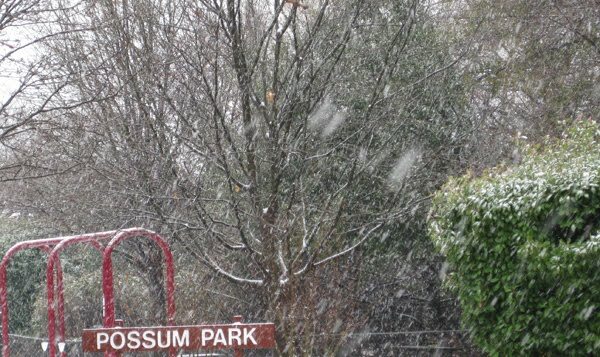 Hopefully not too much later in the week-I hope it's not a long trial. Anyway, have a good Monday! I have Valentine cards on my mind but I have a couple of "top secret" (in case the blog walls have ears teehee) projects in mind first. Sure hoping I don't run out of time, I'm such a slow poke. Off to play housewife for bit and I'll hope to catch up shortly on your posts that I've missed. Your pillows wiil be beautiful. Perfect for Valentine's Day. 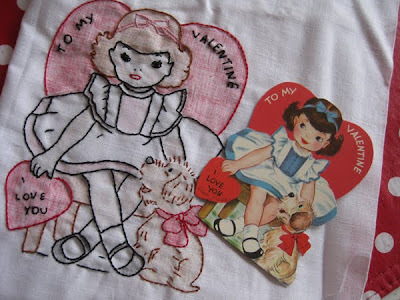 A great idea to use vintage valentines as your inspiration. 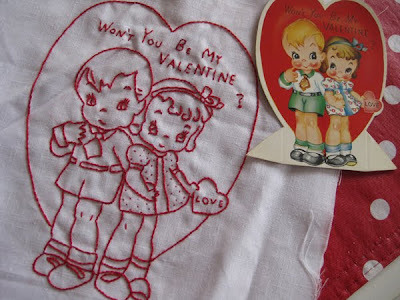 Your embroidered Valentines are fabulous! What a creative idea. Those are too cute! I'm looking forward to seeing how you created them. Hope you don't have to spend a lot of time on jury duty! I just found your blog and love it! Your red work embroidery is so cute! And, you wicker chairs look so good painted black, it really makes the room come alive. You and I like the same kind of things. 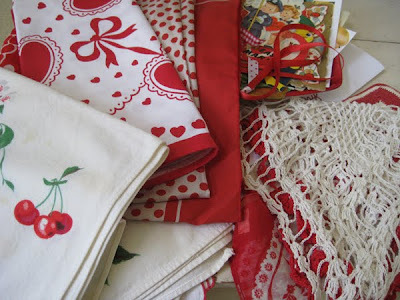 I love vintage linens, toys, etc, too! What a wonderful idea to use Valentine's as redwork patterns!! I'm so sorry, things are not going as planned over here - three weeks of letting the house go insane does not get righted in a day. WAH! I cannot believe the disarray and Christmas is still up. woe is me. I'm leaving hello's and then apologies - rather silly I guess, hopefully I can play in earnest very soon! I wanted to do Rednesday but I can't think of anything to post today??? Hope you're having lots of creative Valentine's Day fun! Can't wait to see all your stuff. What a fabulous idea Leslie. I'm looking forward to seeing how you get the card designs to the fabric. Very creative. Thanks for sharing. Your red Valentine things are so bright and happy. Please visit me too. Beautiful work, and very precious gift for Valentine!